Sheer perfection, Mima Ito gained fame when partnering Miu Hirano to success in the GAC Group 2014 ITTF World Tour German Open in Magdeburg when both were only 13 years old at the time; the success gained the duo a place in the celebrated Guinness Book of Records. 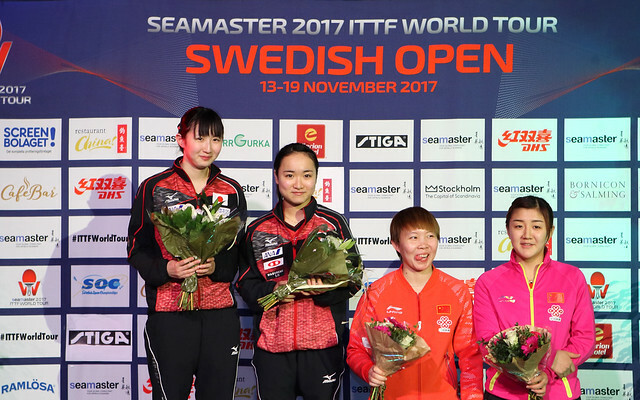 Now over three years later, the partner for Mima Ito is Hina Hayata, similarly born in the year 2000; at the semi-final stage of the Women’s Doubles event at the Seamaster 2017 ITTF World Tour Swedish Open in Stockholm on the afternoon of Friday 17th November, they gave a faultless display. The number of unforced errors could be counted on one hand; the no.2 seeds, they overcame Chinese Taipei’s Chen Szu-Yu and Cheng I-Ching, the no.5 seeds, in three straight games (11-6, 11-6, 11-8). Throughout the contest, the Japanese teenagers were the first to seize the initiate; my view is that Hina Hayata’s great strength is her backhand but after watching the doubles’ duel I may have to re-think my assessment. The fact that she is left handed and Mima Ito right handed, meant that time and again she was afforded the opportunity to release a lethal forehand top spin. Both gave each other space to play, Mima Ito with her fast backhand drive style attacking play was able to change direction from east to west and west to east at will. Equally, Hina Hayata and Mima Ito proved the superior pair over the table, creating angles; time and again Chen Szu-Yu and Cheng I-Ching were fighting to stay in the point. Impressive from Hina Hayata and Mima Ito; it was exactly the same from China’s Chen Meng and Zhu Yuling, the no.3 seeds, they beat Hong Kong’s Doo Hoi Kem and Lee Ho Ching, the top seeds in a most authoritative manner, a straight games win was the outcome (11-5, 13-11, 11-6). In the second game Doo Hoi Kem had an opportunity; they led 10-8 and then 11-10 but were unable to convert the game points. In the third game they lost the first three points, called “Time Out” but to no avail; Chen Meng and Zhu Yuling won six of the next seven points. It was game over. Scheduled to start at 2.00pm (local time) the Women’s Doubles final will be played on Sunday 19th November.